I worked on my gardening goals today and started some seeds indoors. Every year I do this and I thoroughly enjoy it. I take my phone down in the basement with me and prop it on the windowsill and watch Desperate Housewives with my Hulu phone app. Just me, and Susan, Bree, Lynette and Gabby gettin’ dirty with seed starter. Here are a few pics of what I accomplished today. 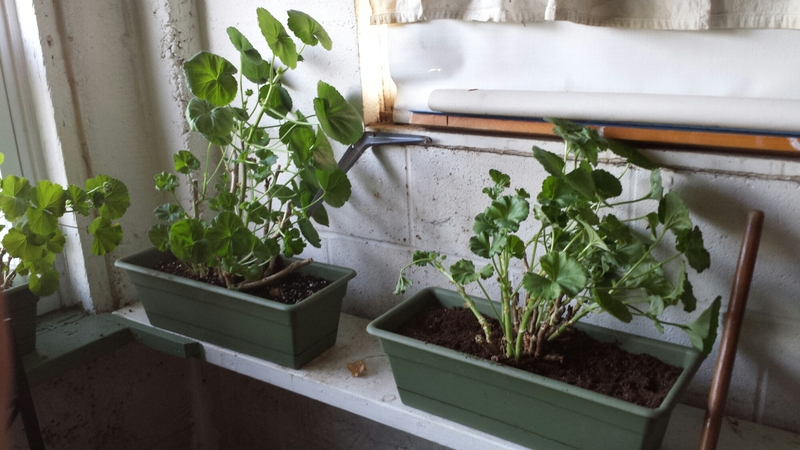 Every Fall I dig up my geraniums and pot them and then overwinter them in our basement. Today I cleaned them all up, getting rid of any dead leaves and flowers. Now I will make sure they get plenty of sunshine and fertilizer to get them ready to go outside in a month or so. It is supposed to be mid sixties this week so I might put them outside just for the day to give them a boost. 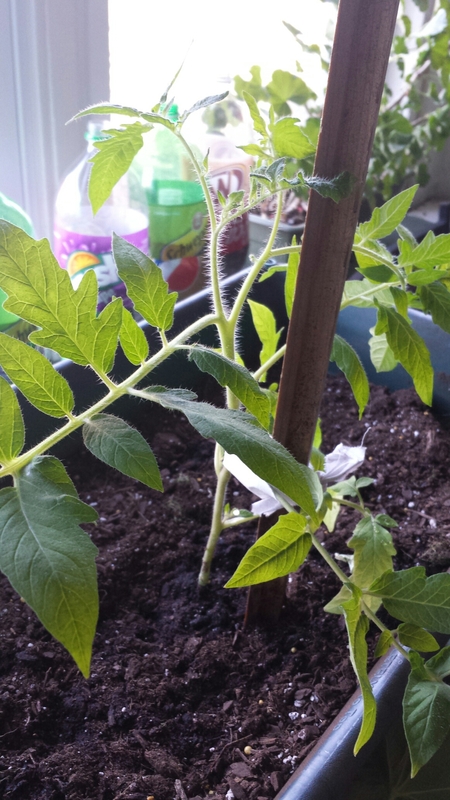 Believe it or not this plant is a tomato that I rescued last fall while bringing in the geraniums. It had just sprouted and only had 2 leaves. It has grown steadily and surely over the winter and I just re-potted it this afternoon in it’s new home. 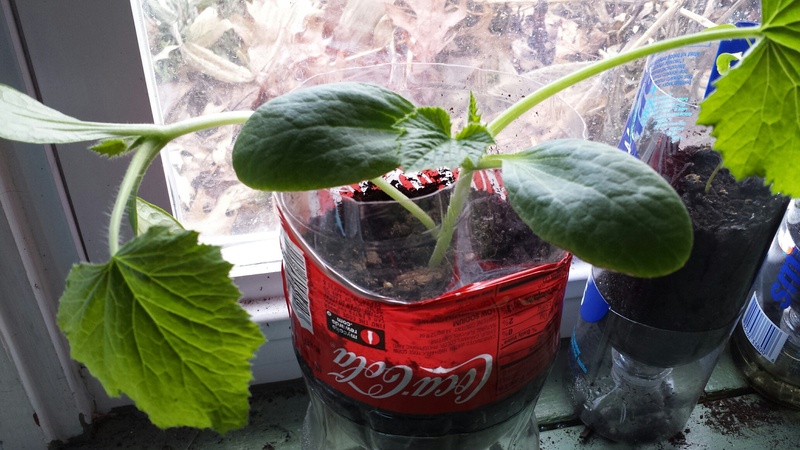 Last year I posted about starting my seeds in a pop bottle construction container. 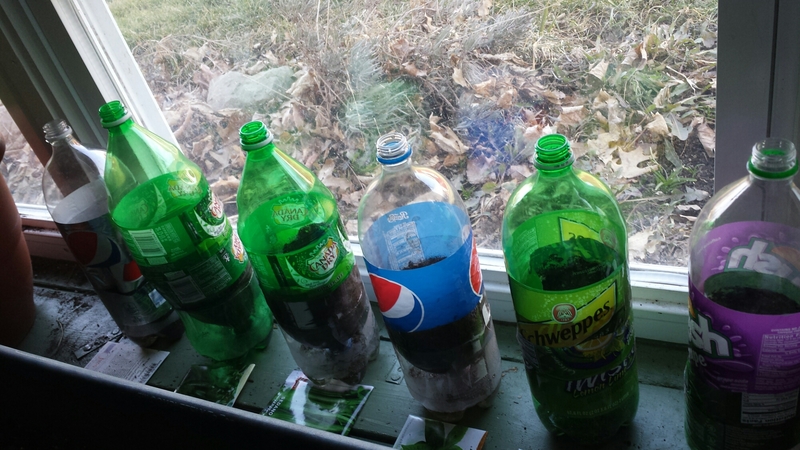 I liked it so much I decided to expand my pop bottle garden this year. Thank you to my wonderful mom-in-law for providing me with the bottles! I can’t wait to update you on their progress. I am sure by next week they will have sprouted. 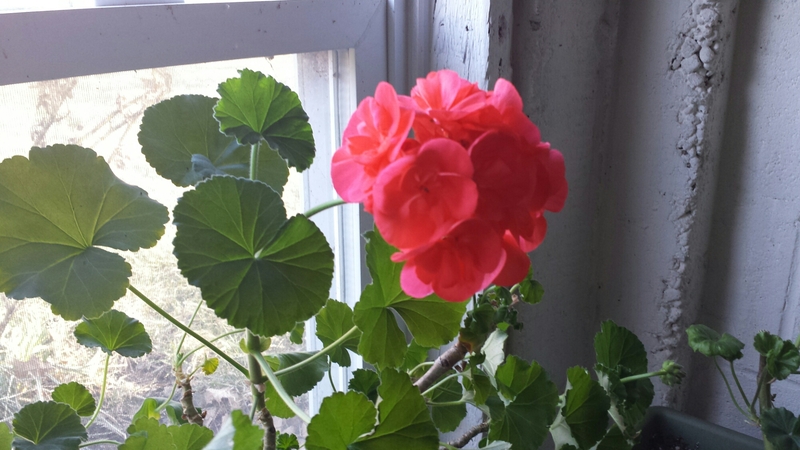 This time of year I am so happy that I dug up my geraniums and brought them in for the winter. A few posts ago I talked about these beauties and now they are in full bloom! What an encouraging lift they are for me every day. I hope to be using these plants as accents this weekend when we host our Church’s Easter Sunrise Service at our home. Stay tuned. My pop bottle experiment has gone fabulously! 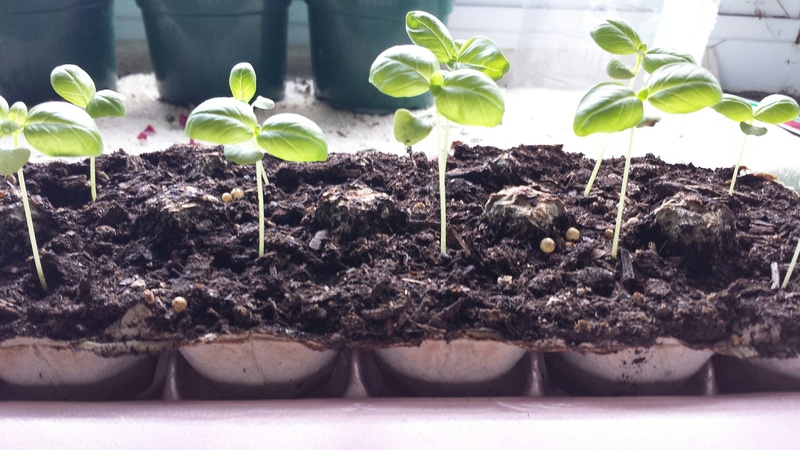 I have replanted all 24 tiny basil seedlings into their own individual space using two biodegradable cardboard egg cartons. Free and easy container space which of course I love. 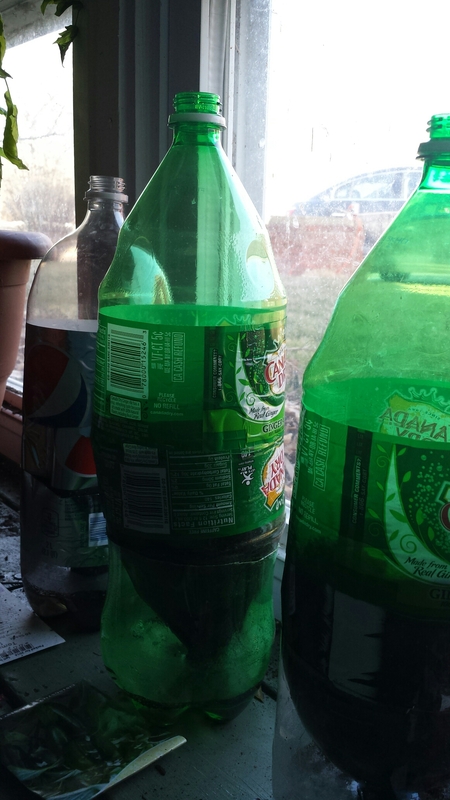 The other seeds I tried in the pop bottle soon overtook their spaces blowing off the tops of the bottles within a few weeks. 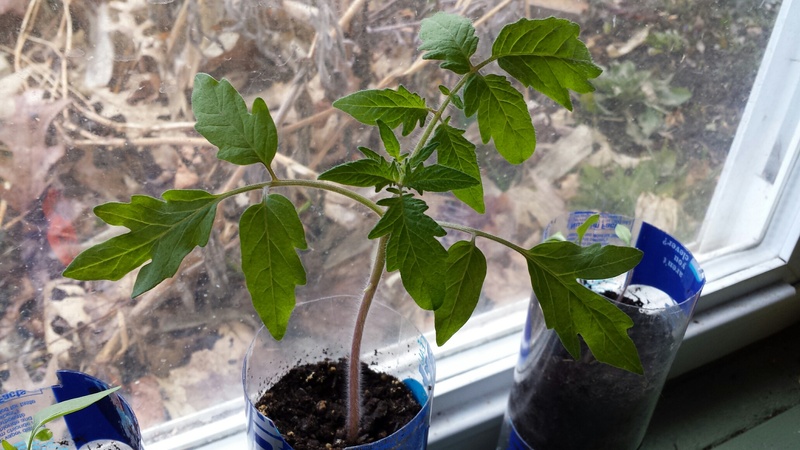 A single tomato plant and zucchini squash were my next experiments. I might have to plant them into another pot instead of waiting until May to set them out. What do you think? I will definitely be using this method next year for starting my seeds. It worked flawlessly. As you can imagine grocery stores have a lot of food waste every day. To the left is an example of what I pulled off the bakery shelves on a typical Friday morning. 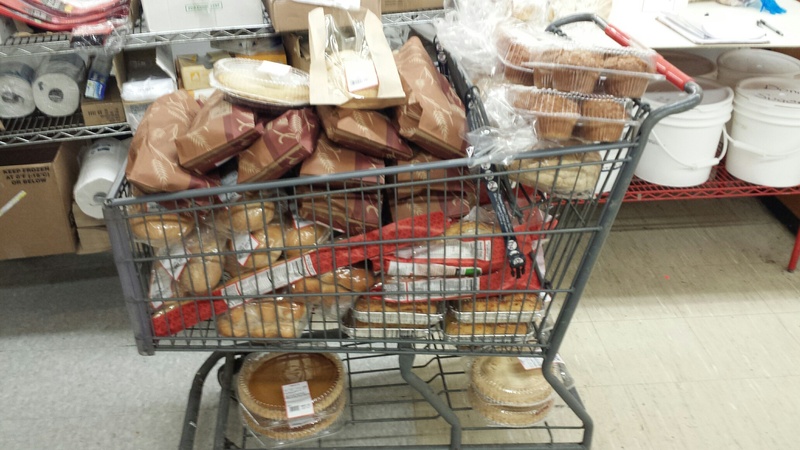 Luckily not all of what is pictured in the cart is thrown out. Not yet anyway. We reduce our out of date items and give our customers a chance to purchase them at a lower cost. After that, if items are not sold on the reduced rack then yes, they will end up in the trash. Sad huh? On a good note though, our store does donate many items that are coming close to their expiration dates to local food pantries and other organizations that will gladly take them. The bakery and deli departments have another unique way we use items that are damaged or otherwise considered unsellable to the general public. We make stuff with them. What kind of stuff? Yummy stuff! Every morning the produce man comes around to the bakery and deli departments to see if we can use any of their day’s freshly pulled damaged or undesirable items. Deli usually grabs the tomatoes and peppers and lettuce and re-purposes them using them in salads and the hot foods case for lunch. Bakery on the other hand can use just about any of the produce. Carrots get ground and used in cakes and muffins, Cranberries get made into coffee cakes, peppers, squash, and asparagus get made into quiche, and of course apples get made into pies. How glorious! This week we got berries. Lots and lots and LOTS of berries. Over ten cases of strawberries in fact. “What the heck do I do with all of these cases of strawberries?” I said to my store manager. I made lots of things with these strawberries. Scones, fruit breakfast bars, filling for cakes, and finally freezer jam. Yep when you are drowning in berries make jam. I made freezer jam because it was easy and quick. Nine, 16 oz. jars. Yippee! I use the jam in my thumbprint cookies which I bake a lot of. I still have a 5 gallon pail of frozen cut-up strawberries in the freezer to use in the future. I was in a winter blues kind of mood yesterday. I was looking through my order book from 2014, before I took my job at the grocery store. Taxes have to be done to finish up closing my business books and I saw all of the people I had baked something for in March and I was kind of sad it was over. I needed something to get me out of my mood so I turned off the computer and got my grungies on and went in my basement to tackle cleaning off my potting workbench. I love gardening. It isn’t work for me. It is relaxation and creativity and a way for me to connect with myself and my surroundings. I feel at peace even if I am shoveling 50 lbs of topsoil or turning my compost pile. In the winter I like to plan and dream of my spring garden. I get my seed catalogs out as soon as the new year arrives. I pour over them looking at what’s new for the season. Sometimes I order and other times I have seeds left over from last year. This year I have a ton of seeds left over from 2014. Working at a grocery store has it’s perks and one day this last fall, I went to sit at the break table for lunch and there were two big boxes of seeds for us employees to take for FREE! 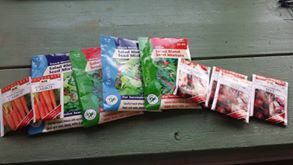 Apparently the grower didn’t want the packets back because they were last year’s seeds and it wasn’t worth it for them to pick them up. So management left a note on the boxes to take any that we wanted. SCORE! I grabbed the carrots, beets and lettuce and let me tell you those lettuce packs were gigantic! We are going to be eating a lot of salads this summer and so is the rest of my family for that matter. Ha! So I cleaned the heck out of my workbench which I love dearly. My grandfather built the workbench into the basement room with the most windows in it so he could start his seedlings in the sunniest spot in the house. It always makes me feel better when I work on it. Today was just cleaning, but I did plant a bit of basil in my new homemade ecosystem thingy that I will show you in another post if it works properly. 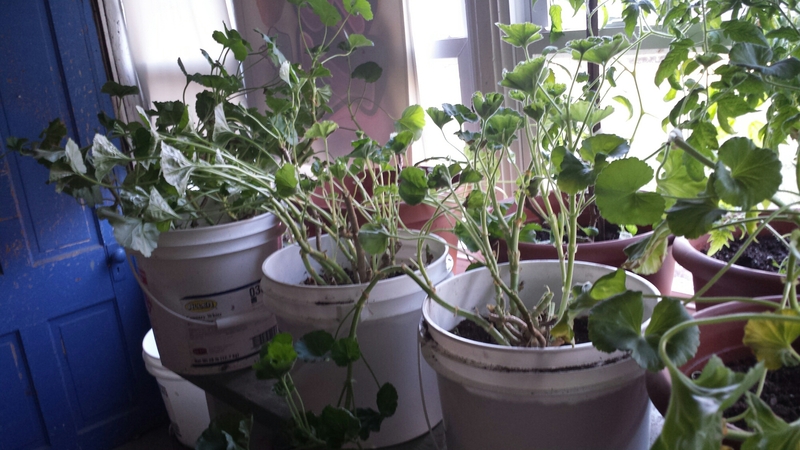 I also got a nice chat in with my geraniums that I re-potted and brought in before our famous November snow storm. One day it was 50 and the next we had three feet of snow. Screwy NY weather. I re-potted 9 geraniums at the last possible second before they got hit with frost and brought them inside. They love it when there is a sunny day and the light streams in warming them.